ProTag Sales is a set of self-animating sales graphics created for use in Final Cut Pro X. 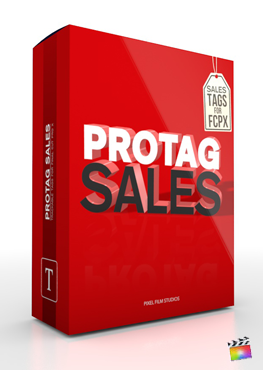 Track and display sale prices, discounts, clearance, new deals, and more with ProTag Sales. Choose from 30 different simplistic designs that includes a motion tracker built in. Easily track and customize each preset with on-screen and published controls. Finally, ProTag Sales is fully customizable exclusively in Final Cut Pro X. This plugin requires Final Cut Pro 10.4 or higher and Mac OS 10.13.